In your walk of life? Haven't seen the movie as yet! dang! ur too good bro! I was going thro ur old posts! Im enormously impressed by ur sketches! I am sure these stuffs will become popular. Hey buddy the money program u have seen is a really working program. If u have still doubts just check out the sites by urself and check the paycheck screenshots. Easy to bring happiness in someones' work..
but not so easy to depict melancholy..
amazing sketch..eyes r damn gud..jokers evil face is depicted nicely..
nice one, it shows all are close to us yet so far from each other.atlast alone!!!! swinging bween the shades of grey..
arent v all like jokers..torn apart frm each other ..
ambushing wad we all hold on to like a treasure.. memories..
in the darkest hour of lonliess .. sweetest memories keep us sane..
and those who dont have it.. r jokers like u n me ..
Aninda ...you are simply amazing man !!! 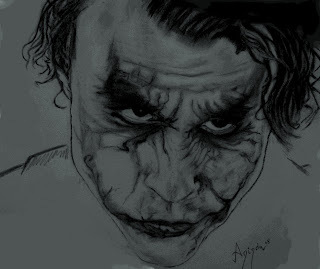 Wow U just drew those expressive eyes ....wow just amazing !! Just Put a smile on that face !! This is the best sketch of all.